A new animal study may help explain why diets high in the sugar fructose have been linked to insulin resistance, a precursor to type 2 diabetes. Watch Dr. Clark explain what causes diabetes and what you can do about it. Avandia (voor diabetes 2) veilig of niet ? We weten intussen dat de bekende stichtingen op het gebied van ziekten toch wel erg vaak nauwe banden onderhouden met big pharma en big food (zoals bijv de Hartstichting). Kritiek op medicatie wordt regelmatig afgedaan als niet relevant en zo blijven pati�nten te lang een bepaald medicijn slikken zonder de risico's te kennen. Maar dan op 28 aug opnieuw bewijs voor de risico's van dit type medicatie, kijken of deze club opnieuw big pharma gaat verdedigen......en even voor de duidelijkheid, er zijn dus medicijnen die dit extra hart- en vaatziekte risico niet hebben, kies dus voor uw eigen gezondheid ! En nog iets, dit medicijn kan ook je botten verzwakken (Link). Zeker gezien de samenwerking met de Nierstichting eens raadzaam om door te nemen omdat fructose als zoetstof ook de nieren giga belast. Lees het boek "The sugar fix" maar eens. A class of oral drugs used to treat type 2 diabetes may make heart failure worse, according to an editorial published online in Heart Wednesday by two Wake Forest University School of Medicine faculty members. "We strongly recommend restrictions in the use of thiazolidinediones (the class of drugs) and question the rationale for leaving rosiglitazone on the market," write Sonal Singh, M.D., M.P.H., assistant professor of internal medicine, and Curt D. Furberg, M.D., Ph.D., professor of public health sciences. Rosiglitazone and pioglitazone are the two major thiazolidinediones. In the editorial Singh and Furberg say, "At this time, justification for use of thiazolidinediones is very weak to non-existent." Oral drugs are given to control diabetes by lowering blood sugar. But diabetics also experience elevated rates of high blood pressure and high levels of cholesterol and triglyceride, which "further compound their already increased risk of developing ischemic heart disease," Singh and Furberg say. Heart disease and high blood pressure "represent conditions that are major precursors of congestive heart failure." About 22 percent of diabetics have heart disease. Among elderly patients with diabetes, more than half will develop congestive heart failure over a 10-year period, the editorial says. The thiazolidinediones were approved for use based on the ability to reduce blood sugar. In contrast, "we reported [in the journal Diabetes Care] in June 2007 that thiazolidinediones doubled the risk of congestive heart failure in patients with type 2 diabetes," is says. "The increased heart failure appears to be a class effect." Singh and Furberg reported in The Journal of the American Medical Association in 2007 after an analysis of four long-term trials that use of rosiglitazone was associated both with increased heart attacks and a doubling of heart failure. They said that results from three large randomized clinical trials published this past June all failed to demonstrate that intensive control of blood sugar reduces mortality or events from cardiovascular disease in patients with type 2 diabetes. The three trials were ACCORD, ADVANCE, and the Veterans Affairs Diabetes study. In ACCORD, the patients who received intensive treatment to control blood sugar actually had more cardiovascular disease mortality than patients receiving standard treatment. In ADVANCE, intensive control of blood sugar produced no benefit; there was no effect on cardiovascular events or deaths from cardiovascular causes compared to standard oral diabetes agents. In the VA Diabetes trial, when intensive blood sugar control produced levels of blood sugar that were too low and led to loss of consciousness, that was a strong predictor of future cardiovascular events. "The unfavorable findings from the three trials have not been fully realized by the medical community," Singh and Furberg say. They say that at a recent U.S. Food and Drug Administration advisory committee meeting, there was "overwhelming support for requiring reductions" of heart disease and heart failure "before approval of new oral hypoglycemic agents." Singh said in an interview, "Safer, cheaper and more effective treatment alternatives are available that do not carry these negative cardiovascular risks in patients with diabetes. The rationale for the use of the thiazolidinediones is unclear." Ondanks alle adviezen die Nederlandse organisaties geven aan pati�nten met diabetes 2 of metabool syndroom om toch maar vetarm te eten blijkt keer op keer dat juist een koolhydraatarm dieet het gezondste is. Met name brood, aardappelen, rijst en andere suikers maken je problemen en buikvet erger. Van vet wordt je niet dik maar wel als je ze combineert met koolhydraten. Dus tijd voor een andere levenswijze en de schade te beperken ! Current nutritional approaches to metabolic syndrome and type 2 diabetes generally rely on reductions in dietary fat. The success of such approaches has been limited and therapy more generally relies on pharmacology. The argument is made that a re-evaluation of the role of carbohydrate restriction, the historical and intuitive approach to the problem, may provide an alternative and possibly superior dietary strategy. The rationale is that carbohydrate restriction improves glycemic control and reduces insulin fluctuations which are primary targets. Experiments are summarized showing that carbohydrate-restricted diets are at least as effective for weight loss as low-fat diets and that substitution of fat for carbohydrate is generally beneficial for risk of cardiovascular disease. These beneficial effects of carbohydrate restriction do not require weight loss. Finally, the point is reiterated that carbohydrate restriction improves all of the features of metabolic syndrome. Het Diabetesfonds adviseert gewoon brood, aardappelen en rijst te blijven eten ! Toch is het offici�le advies vanuit de wetenschap: verlaag het gehalte aan koolhydraten in de voeding niet. Er is geen bewijs dat voeding met weinig koolhydraten voor mensen met diabetes type 2 beter is dan voeding met veel koolhydraten. Ik denk dat het grafiekje boven wel voldoende zegt over het effect van lowcarb bij diabetes. 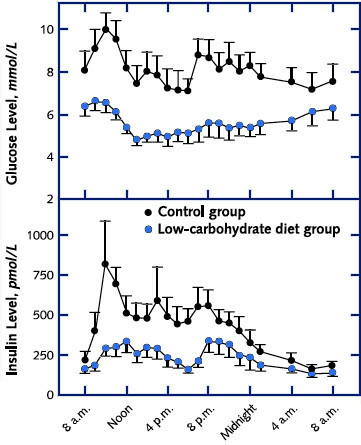 In summary, a reduced carbohydrate diet is an effective tool in the management in motivated obese patients with type 2 diabetes. The effect is generally retained after almost 2 years. There has been no evidence of a negative cardiovascular effect among the 16 subjects. Omdat het Diabetesfonds ook twijfelt aan de glycemische index van voeding nog wat studies voor deze "experts"
Dietary carbohydrates have been directly associated with gastric cancer risk and have been considered general indicators of a poor diet. However, elevated levels of glucose and insulin elicited by consumption of high amounts of refined carbohydrates may stimulate mitogenic and cancer-promoting insulin-like growth factors (IGF). Glycemic index (GI) and glycemic load (GL), which represent indirect measures of dietary insulin demand, were analysed to understand further the association between carbohydrates and gastric cancer. This study supports the hypothesis of a direct association between GL and gastric cancer risk, thus providing an innovative interpretation, linked to excess circulating insulin and related IGFs, for the association between carbohydrates and risk of gastric cancer. This study supports the hypothesis that high dietary GI and GL are associated with cancers of the upper aero-digestive tract. Our study supports the hypothesis of a direct association between GI and endometrial cancer risk. This study supports the hypothesis of a direct association between GI and GL and ovarian cancer risk and, consequently, of a possible role of hyperinsulinemia/insulin resistance in ovarian cancer development. The positive associations of glycemic index and load with colorectal cancer suggest a detrimental role of refined carbohydrates in the etiology of the disease. These data support hypotheses that sucrose intake or being tall or obese increases colon cancer risk; run contrary to the hypothesis that increased parity decreases risk; support previous findings of no association with demographic factors other than age, cigarette smoking, or use of oral contraceptives or estrogen replacement therapy; and raise questions regarding previous associations with meat, fat, protein, and physical activity. Thus, our data indicate that a diet with a high dietary glycemic load may increase the risk of colorectal cancer in women. Our data support other findings that impaired glucose metabolism may play a role in pancreatic cancer etiology. A diet high in glycemic load may increase the risk of pancreatic cancer in women who already have an underlying degree of insulin resistance. Een gezonde stabiele suikerspiegel bereik je door voeding te eten met een laag glycemische waarde..
Diabetes kan een storing zijn van de dunne darm, daarom ontvankelijk voor chirurgische behandeling, volgens een nieuw artikel door een New Yorks - Presbyteriaans/Weill Cornell wetenschapper-chirurg. New York - Toegenomen bewijs toont aan dat een operatie type 2 diabetes effectief kan genezen - een benadering die niet alleen de manier kan veranderen waarop de ziekte wordt behandeld, maar ook een nieuwe manier van denken over diabetes introduceert. Een nieuw artikel - gepubliceerd in een speciale bijlage bij de februari uitgave van Diabetes Care door een vooraanstaand expert in diabetes chirurgie - verwijst naar de dunne darm als mogelijke factor voor de ontwikkeling/het ontstaan van diabetes. De auteur van de studie, Dokter Francesco Rubino van het New Yorks-presbiteriaans ziekenhuis/Weill Cornell Medisch centrum, stelt wetenschappelijke bewijzen voor over de mechanismen van diabetescontrole na een chirurgische ingreep. Klinische studies hebben aangetoond dat met eenvoudige procedures die de maag verkleinen diabetes verbeteren alleen door veel gewicht te verliezen. Door diabetes te bestuderen bij dieren, was dokter Rubino de eerste om wetenschappelijk bewijs te leveren dat maag-darm bypass operaties, die het maag-darm gebied omleiden, diabetes remissie kunnen veroorzaken onafhankelijk van enig gewichtsverlies, en zelfs bij diegene die geen overgewicht hebben. "Door de vraag te beantwoorden hoe diabetes chirurgie werkt, kunnen we misschien antwoorden op de vraag hoe diabetes zelf werkt", zegt Dokter Rubino, professor in de Chirurgie-afdeling van het Weill Cornell Medisch College en hoofd van de maag-darm Metabolisme Chirurgie bij New York-Presbiteriaans / Weill Cornell. Dokter Rubino's onderzoek heeft aangetoond dat de voornaamste mechanismen waardoor maag-darm bypass procedures diabetes onder controle houden, steunen op de bypass van het bovenste gedeelte van de dunne darm - de duodenum en jejunum. Dit is de sleutel die kan wijzen op de oorzaken van diabetes. "Wanneer we de duodenum en de jejunum omleiden, zijn we datgene aan het omleiden dat de bron van het probleem kan zijn", zegt Dokter Rubino. In feite, het is duidelijker geworden dat het maag-darm gebied een belangrijke rol speelt in energie regulatie, en dat veel darmhormonen betrokken zijn in het regelen van suiker metabolismen. "Het mag niemand verbazen dat het chirurgisch wijzigen van de anatomie van de darmen een invloed heeft op de mechanismen die de bloedsuiker spiegel regelen, uiteindelijk diabetes be�nvloeden", zegt Dokter Rubino. Terwijl maag-darm operaties, die de bloedsuiker spiegel verbeteren, diabetes kunnen genezen, blijkt uit onderzoek van dieren dat procedures gebaseerd op een bypass van de dunne darm kunnen werken door abnormaliteiten van het glucose gehalte in het bloed om te keren/om te schakelen. In feite, bypass van het bovenste gedeelte van de dunne darm verbetert de mogelijkheid van het lichaam niet om de bloedsuikerspiegel te regelen. "Wanneer uitgevoerd bij subjecten die geen diabetes hebben, kan de bypass van de dunne darm zelfs de mechanismen beschadigen die het glucose niveau van het bloed regelen", zegt Dokter Rubino. Een opvallende tegenstelling, wanneer de doorgang van voedingsstoffen is afgeleid/omgeleid van de dunne darm van diabetespatienten, wordt diabetes opgelost. Dit, legt hij uit, impliceert dat de dunne darm van diabetespatienten het gebied kan zijn waar een abnormaal signaal wordt geproduceerd, die de oorzaak kan zijn, of toch tenminste bijdragen tot de ontwikkeling van de ziekte. Hoe de dunne darm niet goed werkt, blijft nog aan te zien. Dokter Rubino stelt een uitleg voor als de in de wetenschappelijke gemeenschap gekende "anti-incretin theorie". Incretines zijn hormonen van de maag-darm, geproduceerd als reactie op de transit van voedingsstoffen, die de insuline productie verhogen. Omdat een teveel aan insuline hypoglycemia (extreem laag niveau van de bloedsuikerspiegel) kan bepalen - een levensbedreigende aandoening - speculeert Dokter Rubino dat het lichaam een tegen/contra mechanisme heeft (of een "anti-incretin" mechanisme), geactiveerd door dezelfde doorgang/transit van voedingsstoffen door de dunne darm. Dat mechanisme zou dienen om �n de uitscheiding/afscheiding �n de insuline te doen dalen. "Bij gezonde pati�nten handhaaft een correct evenwicht tussen incretine en anti-incretine factoren het normale suikerniveau in het bloed", legt hij uit. "Bij sommigen kunnen de duodenum en de jejunum te veel van dit anti-incretine produceren, daardoor wordt insuline verlaagd en uiteindelijk resulteert dit in type 2 Diabetes. Bij type 2 Diabetes zijn de cellen resistent/immuun tegen insuline, terwijl de pancreas niet in staat is om genoeg insuline te produceren om de resistentie te overwinnen. Na maag-darm bypass operaties kan de uitsluiting van het bovenste gedeelte van de dunne darm de abnormale productie van anti-incretin compenseren, daardoor resulteert dit in een vermindering van diabetes. Om deze mechanismen beter te kunnen verstaan, doet Dokter Rubino een oproep om van onderzoek naar diabetes chirurgie een prioriteit te maken. "Verder onderzoek naar de exacte moleculaire mechanismen van diabetes, chirurgische controle van diabetes en de rol van de darmen in deze ziekte kan ons dichter brengen bij de oorzaak van diabetes." Vandaag hebben de meeste pati�nten met diabetes geen keuze tot operatie, en een maag-darm operatie om gewicht te verliezen wordt alleen aanbevolen voor diegene met een zwaar overgewicht (een BMI van meer dan 35 kg). "Het is nochtans duidelijk dat een BMI vermindering niet langer wordt gebruikt om te bepalen wie een ideale kandidaat is voor een chirurgische behandeling van diabetes", zegt Dokter Rubino. "Er is zelfs een toegenomen bewijs dat diabetes chirurgie effectief kan zijn voor pati�nten die lichtjes zwaarlijvig zijn of gewoon een overgewicht hebben. Klinische proeven zijn daarom een prioriteit omdat deze ons kunnen toestaan om diabetes chirurgie te vergelijken met andere mogelijkheden in een poging om te kunnen begrijpen of de voordelen van deze chirurgie belangrijker zijn dan de nadelen. Klinische richtlijnen voor diabetes operaties zullen zeker anders zijn dan deze voor operaties om gewicht te verliezen, en zouden niet gebaseerd mogen worden alleen op BMI", zegt hij. "De les die we geleerd hebben met diabetes chirurgie is dat diabetes niet altijd een chronische en meedogenloze ziekte is, waar het enige doel van een mogelijke behandeling alleen de controle is van hyperglycemia en het minimaliseren van het risico op complicaties. De chirurgie van maag en darm biedt de mogelijkheid van complete remissie van de ziekte. Dit is een groot hulpmiddel in de manier waarop we het doel van de behandeling beschouwen voor diabetes. Dit is nog nooit voorafgegaan in de geschiedenis van de ziekte", voegt Dokter Rubino eraan toe. Type 2 diabetes, dat beschouwd wordt voor 90 tot 95 % van alle gevallen van diabetes, is een groeiende epidemie die meer dan 200 miljoen mensen wereldwijd teistert. Op het moment dat diabetes epidemisch groeit wereldwijd, zegt Dokter Rubino dat het vinden van nieuwe behandelingsstrategi�n een race wordt tegen de tijd. "Op dit moment is het geen optie om de mogelijkheid te missen die chirurgie beidt." Naast het hebben uitgevoerd van belangrijke studies op het gebied van diabetes chirurgie, heeft Dokter Rubino ook als eerste een invloedrijk Diabetes Surgery Summit georganiseerd in Rome in maart 2007. Deze internationele consensus conferentie heeft ertoe bijgedragen om internationale aanbevelingen te maken voor het gebruik van chirurgie. Dokter Rubino is een oprichtend lid. De Wereldgezondheidsorganisatie voorspelt dat het aantal diabetici wereldwijd zal verdubbelen van 143 miljoen in 1997 naar 300 miljoen mensen in het jaar 2025. Het overgrote deel heeft diabetes type 2 met insulineresistentie. Hadden aanvankelijk alleen oudere mensen diabetes type 2 (vandaar de naam ouderdomsdiabetes), de laatste jaren wordt de ziekte steeds vaker bij dertigers en zelfs bij kinderen gediagnostiseerd. Dit komt mede door toename van overgewicht en inactiviteit bij kinderen. Van de mensen met insulineresistentie en syndroom X krijgt uiteindelijk 20% diabetes type 2. Uit de toename van het aantal mensen met diabetes type 2 kan worden afgeleid, dat het aantal mensen met syndroom X navenant stijgt. Langdurig verhoogde bloedglucosewaarden bij diabetespati�nten  zogenaamde hypers (hyperglykemie)  kunnen tot hersenschade leiden. Dit blijkt uit onderzoek van neuropsycholoog Alette Wessels van VU medisch centrum. Dat juist teveel glucose (suiker) in het bloed tot blijvende schade in de hersenen kan leiden, is met name belangrijk voor type 1 diabetespati�nten. Vaak proberen zij vooral te lage glucosewaarden in hun bloed te voorkomen, omdat ze zich bij zon hypo plotseling heel slecht voelen: ze gaan trillen, zweten en krijgen een hongergevoel. Bij een hyper zijn de symptomen minder acuut. Uit deze cohort studie van de Harvard School of Public Health blijkt dat er een relatie is tussen de inname van dierlijk ijzer (haem ijzer) en de kans op het krijgen van diabetes 2. Deze relatie werd niet aangetoond mbt ijzer uit plantaardige bron. Wel interessant is deze onderstaande studie waarbij het offici�le diabetes (ADA) dieet van de Amerikaanse diabetes vereniging werd vergeleken met een vetarm veganistisch dieet. En wat bleek? Volgens Amerikaanse onderzoekers hebben zogenaamde Afrikaanse Amerikanen minder kans op diabetes als zij kiezen voor een magnesiumrijk dieet (met name de volkoren granen). Dit bleek al eerder uit studies op blanke vrouwen. Diabetes - een sociale ziekte? Volgens auteur David Spiro is diabetes een sociale ziekte veroorzaakt door een milieu met veel stress en suiker en die weinig kansen biedt om tevreden over jezelf te zijn. Mensen die genoeg kracht, zelfvertrouwen, kennis, geld and sociaal netwerk hebben zijn in staat deze ongezonde omgeving te weerstaan en gezond te blijven. Maar mensen met minder middelen en kracht hebben meer stress en zwaardere levens waardoor ze ook meer risico lopen op diabetes en hartziekten. Om deze problemen aan te pakken is dus sociale samenwerking nodig waarbij mensen elkaar helpen en steunen en helpen bij het bereiken van doelen, verbeteren van het zelfvertrouwen, vergroten van de kennis etc. Willen we dit soort ziekten echt uitbannen dan moet er echt anders naar dit soort ziekten worden gekeken. De universiteit van Hannover heeft samen met de Medizinische Hochschule te Hannover een klinische studie gedaan naar de werking van kaneel bij diabetes type 2. De studie bewijst dat kaneel een significante daling van de glucosespiegel bewerkstelligt. De klinische studie is in mei 2006 gepubliceerd in het gerenommeerde tijdschrift 'European Journal of Clinical Investigation'. In 2005 hebben de universiteit van Hannover en de Medizinische Hochschule te Hannover de werking van kaneel bij diabetes type 2 onderzocht. Gedurende vier maanden werd een placebogecontroleerde klinische studie verricht onder 79 pati�nten met diabetes type 2. Het betrof pati�nten die reeds tabletten innamen om de bloedsuiker te verlagen, maar geen insuline spoten. De pati�nten werden evenredig ingedeeld in twee groepen. De ene groep kreeg drie keer daags een placebocapsule, de andere groep kreeg drie keer daags een capsule met kaneelextract. De dagdosering van het kaneelextract kwam overeen met drie gram kaneelbastpoeder van de Cinnamomum cassia. Na vier maanden was in de placebogroep een daling van de glucosespiegel te zien van gemiddeld 3,7 procent. In de groep die de capsules met kaneelextract slikten, was de glucosespiegel gemiddeld 10,3 procent gedaald, een significante daling. De klinische studie bewijst dat kaneel van de Cinnamomum cassia bij diabetes type 2 pati�nten voor een significante daling van de glucosespiegel zorgt. Canadese en Amerikaanse onderzoekers van de Universiteit van Toronto, George Washington en Noord Carolina hebben 99 personen gevraagd mee te doen aan een onderzoek (1). Groep 1 at geen vlees, vis, gevogelte, zeevruchten, eieren, melk of overige melkprodukten. Groep 2 hield zich aan een dieet, voorgeschreven door de Amerikaanse Diabetes Associatie. Na 22 weken kon 43 % van Groep 1 de hoeveelheid medicijnen (waaronder insuline) verminderen of zelfs stoppen. De cholesterolwaarden waren lager en er was sprake van een gewichtsverlies van 6,5 kilo. Van Groep 2 was dit maar 26 % en een gewichtsverlies van 3,1 kilo. De onderzoekers denken dat dit positieve resultaat van Groep 1 ontstaat door het innemen van minder ijzer en diverse soorten vet. Groep 1 bevestigt dat deze manier van eten gemakkelijk vol te houden is; calori�n hoeven niet geteld te worden. De onderzoekers hopen dan ook dat diabetici eerst gaan proberen hun eetgewoonten te veranderen in plaats van direct medicijnen te gaan gebruiken. (1) Barnard ND, Cohen J, Jenkins DJ, et al. A low-fat vegan diet improves glycemic control and cardiovascular risk factors in a randomized clinical trial in individuals with type 2 diabetes, Diabetes Care, 2006 Aug;29(8):1777-83. Een nieuwe Canadese studie door onderzoeker Dr Gillian Booth, een wetenschapper van the Institute of Clinical Evaluative Sciences in Toronto, Canada toont aan dat mensen met type 2 diabetes 15 jaar eerder te maken kunnen krijgen met hartaanvallen, hartstilstanden en dus een mogelijke dood dan mensen zonder diabetes. De resultaten van deze studie zijn deze maand gepubliceerd in het gezaghebbende journal The Lancet. Een nieuwe Engelse studie zorgt voor nieuwe bewijsmateriaal voor de theorie dat infecties en belangrijke rol kunnen spelen bij het ontstaan van diabetes bij kinderen en jonge volwassenen. De studie heeft 25 jaar lang 4000 personen met Diabetes type 1 tussen de 0-29 jaar gevolgd in de plaats Yorkshire, Engeland. Dit is het eerste keer dat zo'n studie onder jonge volwassenen werd gepubliceerd. Alleen al in Engeland zijn er 250.000 personen met het type 1 Diabetes en het aantal kinderen met deze aandoening stijgt met 3% per jaar. Door deze aandoening kan het lichaam geen insuline meer aanmaken. Onderzoekers van het Diabetes Preventie Programma, gesponsord door het National Institutes of Health concluderen na een grote studie naar het effect van medicijnen en preventie van diabetes dat niet depressie zelf maar juist de medicatie voor een twee tot drie keer hoge kans op diabetes zorgde. Volgens onderzoekers van de University of Reading (UK) kunnen bladeren en bloemen van de meidoorn helpen om de bloeddruk van pati�nten met diabetes 2 te verlagen (study in de Juni uitgave van the British Journal of General Practice (BJGP)). De meidoorn wordt in Engeland volop gebruikt door natuurartsen dus wilde de onderzoekers weten of het echt werkte. Het effect was weliswaar klein maar zeker interessant in combinatie met de effecten door veranderingen in het dieet. Omdat hoge bloeddruk een typisch Westers probleem is, kan een veilige natuurlijke benadering altijd de moeite zijn om verder te onderzoeken. De auteurs zeiden verder dat deze studie meer bewijs levert van een veilige toepassing van de meidoor, een kruid zonder beperkingen bij langer gebruik. Uit Engels onderzoekt blijkt dat zowel diabetes type 1 als type 2 het risico op complicaties bij zwangerschappen sterk vergroot. Engelse specialisten zeggen dan ook dat deze vrouwen extra hart scans van de baby moeten krijgen vanwege de extra risico's voor het kind tot aan overlijden toe. (*) Rouse IL, Beilin LJ. Editorial review: vegetarian diet and blood pressure. J Hypertension 1984;2:231-40. // Lindahl O, Lindwall L, Spangberg A, Stenram A, Ockerman PA. A vegan regimen with reduced medication in the treatment of hypertension. Br J Nutr 1984;52:11-20. De American Heart Association verwijst naar de principes van de DASH-voeding waarin onder andere de nadruk gelegd op het gebruik van veel groenten (300 g) en fruit (2 tot 3 stuks) en 2 tot 4 porties magere zuivelproducten per dag. Een nieuwe Amerikaanse studie onthult dat verhoogde levels van het molecule RBP4 (retinol binding protein 4) een teken kan zijn dat er een begin van ontwikkeling van insuline ongevoeligheid is, dit is een belangrijke oorzaak van diabetes type 2 en hartziekten. Onderzoekers van het Beth Israel Deaconess Medical Center (BIDMC) hebben dus een nieuw doel gevonden, het verlagen van dit specifieke eiwit in het lichaam bij personen met kans op diabetes. Bij ernstig zieke pati�nten kan al een kleine verhoging van de bloedsuikerspiegel de kans op overlijden sterk vergroten. Dit blijkt uit een nieuwe studie onder 216.000 intensive-care pati�nten in veteranen ziekenhuizen. De risico's ware het hoogst bij pati�nten met hartproblemen en die diabetes hadden zonder dit te weten. Diuretics and beta-blockers, used to treat hypertension, are associated with an increased risk of developing type 2 diabetes, new findings indicate. The risk of developing diabetes in subjects taking thiazide-type diuretics compared with those not taking a thiazide was increased by 20 percent in older women, 45 percent in younger women, and 36 percent in men, after taking account of age, weight, physical activity, and other risk factors. Compared to patients not taking a beta-blocker, older women taking beta-blockers had a 32 percent higher risk of diabetes, while for men the risk was 20 percent higher. We found that thiazide diuretic use was independently associated with an increased risk of type 2 diabetes in three distinct cohorts. The use of �-blockers also was independently associated with increased risk in older women and men. Although we did not ascertain the use of �-blockers in the cohort of younger women, the use of other antihypertensives, a category presumably including �-blockers, was associated with increased risk. The use of calcium channel blockers and ACE inhibitors was not associated with the development of type 2 diabetes. Ingrid Jazet liet dikke pati�nten met diabetes type 2 gedurende 30 dagen een zeer streng dieet volgen, terwijl ze stopten met hun bloedsuikerverlagende medicijnen. Bij wie zelf nog voldoende insuline aanmaakte, daalde het bloedsuikergehalte al na twee dagen. Dit bleek veroorzaakt door een verminderde glucoseproductie door de lever. Een deel van de pati�nten bleef het strenge dieet volgen tot ze de helft van hun overgewicht kwijt waren. Bij deze pati�nten bleek ook de insulinegevoeligheid spectaculair verbeterd. Ook als pati�nten na achttien maanden weer op hun oude gewicht zaten, bleken het bloedsuikergehalte, de bloeddruk en het vetgehalte gunstiger dan voorheen. Dertig dagen streng di�ten is dus een veilige en waardevolle therapie voor zwaarlijvige diabetespati�nten. Bij voldoende insulineproductie kunnen bloedsuikerverlagende middelen tijdens het dieet het best worden gestaakt. Dat vergemakkelijkt het di�ten en voorkomt een te laag bloedsuikergehalte. Brown Medical School (US) brengt insuline in het middelpunt van de belangstelling. Men vond abnormaal lage niveaus van insuline en insuline groeifactoren in delen van de hersenen die het meest waren aangetast door Alzheimer, en men vond dat deze lage niveaus bijdroegen tot brain rotting. Eerder onderzoek toonde aan dat insuline helpt bij het reguleren van amyloid en de vorming van destructieve vormen van tau helpt te voorkomen. Studies vonden tevens dat mensen met type 2 diabetes, waarbij de cellen ongevoelig worden voor insuline, een groter risico lopen op het ontwikkelen van Alzheimer. Volgens Dr. Henry Klar Yaggi van de Yale University in New Haven, USA.die een 15 jarige studie deed naar slaap en ontwikkeling van diabetis op ruim 1100 mannen van middelbare leeftijd blijken dat mannen die minder dan 6 uur slapen een dubbele kans op diabetes hebben. Mannen die langer dan 8 uur slapen lopen zelfs een drievoudige kans op diabetis. Het komt er dus op neer dan lang slapen nog ongezonder is dan kort slapen. Onderzoekers van het Sacro Cuore Hospital in Negrar (Itali�) onderzochten 459 pati�nten met Diabetes II en controleerden hun vitamine D levels. Hieruit bleek maar liefst 60% van hen een tekort aan vitamine D te hebben. Dit kan ernstige gevolgen hebben voor oa de botdichtheid. Ook speelt vitamine D een cruciale rol bij de preventie van borstkanker, prostaatkanker en darmkanker. Suppletie van vitamine D wordt door steeds meer onderzoekers geadviseerd. Vitamine D komt ook voor in vette vis, oesters, melk en levertraan en uit zonlicht en is ook belangrijk voor het gezond houden van je longen. Geneesmiddelen tegen psychose kunnen suikerziekte veroorzaken, zo concludeert psychiater Dan Cohen in onderzoek dat hij bij het UMC Utrecht uitvoerde. Daarbij komt suikerziekte bij mensen met schizofrenie vaker voor. Omdat zij meestal ook antipsychotica gebruiken, zijn zij dubbel vatbaar voor suikerziekte. Cohen baseert zijn conclusie op epidemiologisch onderzoek onder een half miljoen inwoners van de regio Utrecht en op een onderzoek onder 3000 pati�nten met diabetes mellitus (suikerziekte). Hij vond onder gebruikers van antipsychotica vaker suikerziekte, ongeacht de psychiatrische diagnose. Bij pati�nten met schizofrenie komt diabetes gemiddeld twee keer zoveel voor, in de leeftijd van 30 tot 40 jaar zelfs tien keer zoveel. Schizofrenie blijkt een risicofactor voor diabetes, stelt Cohen, los van gewicht, leeftijd en de invloed van geneesmiddelen. Cohen deed ook literatuuronderzoek naar het ontstaan van diabetes door de nieuwe, zogenoemde atypische antipsychotica. In de eerste zes maanden kunnen deze middelen bij mensen onder de vijftig jaar een ernstige en soms dodelijke ontregeling van de suikerspiegel veroorzaken. Cohen vond in de wetenschappelijke literatuur 73 gevallen van acute diabetes door antipsychotica, waardoor twee van deze pati�nten overleden. Het voorschrijven van antipsychotica is een medische handeling, stelt hij. Om suikerziekte tijdig op te sporen en een dodelijke ontregeling te voorkomen, moet je bij pati�nten nuchter het bloedsuikergehalte bepalen gedurende de eerste drie maanden van behandeling met een antipsychoticum, ongeacht de leeftijd van de pati�nt en ongeacht de soort antipsychotische medicatie. Hartproblemen zijn de voornaamste doodsoorzaak bij diabetes. Een verstoorde vetzuurhuishouding in het hart draagt mogelijk bij aan het ontstaan hiervan. Gezonde hartspiercellen halen hun energie voornamelijk uit het verbranden van vetzuren. FAT/CD36, een vetzuurtransporteiwit, reguleert de vetzuuropname door hartspiercellen. Dit proefschrift beschrijft hoe de vetzuurhuishouding tijdens het samentrekken gereguleerd is in het rattenhart. Daarnaast toont het aan dat tijdens insulineresistentie de FAT/CD36-gemedieerde vetzuuropname door hartspiercellen toegenomen is. Hierdoor vindt er een nadelige stapeling van vetten in het rattenhart plaats. Nieuwe therapie�n die zich richten op het voorkomen van deze stapeling kunnen leiden tot een verbetering van de hartfunctie bij diabetes. Werknemers met suikerziekte zijn niet automatisch extra moe door de combinatie van werk en ziekte. Dit concludeert NWO-promovendus Iris Weijman. Werknemers met diabetes met meerdere chronische aandoeningen en mensen die last hebben van hun ziekte, lopen wel meer risico. Weijman promoveert op 1 maart aan de Universiteit Utrecht. Uit Weijman's onderzoek blijkt dat werknemers met diabetes niet automatisch vermoeider zijn dan andere werknemers. Bij mensen met diabetes raakt de energiebalans gemakkelijk verstoord, waardoor zij vaker vermoeid zijn. Door de dubbele belasting van ziekte en werk verwachtten onderzoekers dat de kans op vermoeidheidsklachten extra groot zou zijn bij deze groep werknemers. Weijman toont aan dat deze aanname niet correct is. Mensen met diabetes zijn waardevolle werknemers wanneer zij kunnen functioneren in een voor hen goede omgeving, zo suggereert de promovendus. Met de resultaten van het onderzoek kan de begeleiding van werknemers met diabetes door professionals uit de zorg en de beroepssfeer, zoals bedrijfsartsen en re�ntegratiebureau's, worden verbeterd. Mensen met diabetes met meerdere chronische aandoeningen lopen wel een groter risico op vermoeidheid door de combinatie van ziekte en werk. Ook pati�nten die veel hinder door symptomen van de ziekte ervaren zijn vaker moe, evenals diegenen die het uitvoeren van belangrijke zelfmanagementactiviteiten als een belasting ervaren. Het verlagen van de werkdruk en vooral de steun van collega's en leidinggevende zijn erg belangrijk om de last op werknemers die veel klachten van de ziekte ervaren te verlichten. Een belangrijk aspect bij diabetes is het uitvoeren van zelfmanagementactiviteiten, zoals het spuiten van insuline, rekening houden met voedingsrichtlijnen en controleren van de bloedsuikerspiegel. Weijman laat zien dat mensen die het uitvoeren van deze activiteiten niet lastig vinden, zich gezonder voelen. De mate waarin men zichzelf in staat acht deze taken uit te voeren, is deels bepalend voor de ervaren last. Weijman ontdekte ook dat vermoeide werknemers met diabetes een andere visie hebben op hun ziekte en hun werksituatie. Zij vinden flexibiliteit in het werk eerder vervelend, terwijl mensen met weinig vermoeidheidsklachten flexibiliteit juist prettig vinden. Werknemers met weinig klachten kunnen door die flexibiliteit de ziekte en het werk waarschijnlijk beter combineren. NWO-programma Psychische Vermoeidheid in de Arbeidssituatie (PVA). Pati�nten met diabetes type 2 (voorheen `ouderdomsdiabetes') hebben een grote kans op complicaties en staan daarom onder regelmatige controle. Ongeveer 850 duizend mensen in Nederland hebben diabetes en artsen kunnen de diabeteszorg niet alleen aan. Bas Houweling ontdekte dat verpleegkundigen een groot deel van deze diabeteszorg heel goed kunnen overnemen van artsen. De zorg blijft kwalitatief even goed en de pati�nten zijn zelfs meer tevreden. De maatregel zal een kostenbesparing kunnen opleveren en past bovendien in het kabinetsbeleid. Minister Hoogervorst heeft, gezien het verwachte artsentekort, taakverschuiving in de diabeteszorg hoog op de politieke agenda gezet. Houweling vergeleek voor zijn onderzoek twee groepen pati�nten: de ene helft werd door een arts behandeld, de andere door een verpleegkundige. De verpleegkundigen hadden altijd de mogelijkheid om met een arts te overleggen en konden bij het voorschrijven van geneesmiddelen gebruik maken van protocollen, gebaseerd op de Nederlandse diabetesrichtlijnen. De promovendus onderzocht vervolgens of de medische behandeling, kwaliteit van leven, diabetesgerelateerde klachten en tevredenheid van pati�nten ten minste gelijk zijn aan die van de door artsen geleverde zorg. Zowel pati�nten die bij de huisarts komen, als degenen die zijn doorverwezen naar een internist blijken minstens evengoed te worden behandeld wanneer de taken zijn overgenomen door respectievelijk een praktijkondersteuner en een diabetesverpleegkundige. Bas Houweling (Woerden, 1971) studeerde geneeskunde in Groningen. Hij verrichtte zijn onderzoek binnen het NCG (Noordelijk Centrum voor Gezondheidsvraagstukken) en was daarvoor via de vakgroep Huisartsgeneeskunde gedetacheerd op de diabetespolikliniek van de Isala Klinieken in Zwolle. Het onderzoek is financieel mogelijk gemaakt door het Medisch Research Fonds Zwolle, de Stuurgroep Zorgvernieuwing van de Isala Klinieken en het Ministerie van Volksgezondheid, Welzijn en Sport. Momenteel is Houweling huisarts in opleiding bij de huisartsopleiding in Groningen. Steeds meer mensen zullen in de toekomst te maken krijgen met chronische ziekten als diabetes. Die vragen om een andere visie op ziekte en gezondheid. Dat zegt minister Hoogervorst tijdens het VWS diabetescongres in Den Haag, dat morgen wordt gehouden. Hoogervorst schetst tijdens het congres zijn ideaalbeeld van de zorg voor diabetespati�nten over een paar jaar. Daarin gaat de pati�nt zelf op een verantwoordelijke manier met zijn ziekte om, en voelen zorgaanbieders zich samen verantwoordelijk voor de kwaliteit van het geleverde product, aldus Hoogervorst. Het ministerie van VWS heeft de afgelopen twee jaar veel ge�nvesteerd in de aanpak van diabetes. De ziekte is gekozen tot een van de speerpunten in het preventiebeleid. Samen met verzekeraars en zorgaanbieders is een keten-dbc (diagnosebehandelingscombiniatie) ontwikkeld. Daarin is vastgelegd welke standaardhulp nodig is voor een goede behandeling van diabetes. Een taakgroep heeft bovendien voorstellen ontwikkeld voor een nieuwe aanpak waarin de verschillende zorgaanbieders samenwerken. De minister komt nog voor het zomerreces met een standpunt op de rapportage van deze taakgroep. Een nieuw ontwikkeld apparaat kan op een snelle manier van buiten af bepalen of een pati�nt een hoge mate van versuikerde eiwitten in zijn lichaam heeft. Versuikerde eiwitten spelen een belangrijke rol bij het ontstaan van hart- en vaatziekten, vooral bij pati�nten met suikerziekte of nierziektes. Door de lichtgevendheid van de huid te meten kan de mate van aanwezigheid van versuikerde eiwitten aangetoond worden. Tot nu toe was dit niet mogelijk zonder huidbiopten van pati�nten te nemen. Dit blijkt uit onderzoek van Robbert Meerwaldt van de vakgroep Vasculaire Ziekten en Endocrinologie van het Universitair Medisch Centrum Groningen (UMCG). Meerwaldt promoveert op 7 september 2005 aan de Rijksuniversiteit Groningen. Het apparaat, een autofluorescentie meter (AGE reader), meet de hoeveelheid licht die de huid uitstraalt. Een pati�nt hoeft slechts enkele seconden zijn arm op het apparaat te leggen en de mate van lichtgevendheid is al bepaald. Uit het onderzoek blijkt dat deze lichtgevendheid de hoeveelheid versuikerde eiwitten in het lichaam aangeeft. `Het blijkt dat de versuikerde eiwitten zelf licht uitzenden. Die kunnen we nu op een heel pati�ntvriendelijke manier meten. Het nemen van bijvoorbeeld huidbiopten om deze waarden te bepalen is dus niet nodig', concludeert Meerwaldt. De aanwezigheid van versuikerde eiwitten in het menselijk lichaam kan het ontstaan van hart- en vaatziekten en van nierziektes voorspellen. De stapeling van de versuikerde eiwitten leidt verder tot een versnelde aderverkalking, lekkende bloedvaten, hoge bloeddruk en zenuwstoornissen. De lichtgevendheid van de huid bleek het ontstaan van deze problemen en de kans om hieraan te overlijden te voorspellen. Door al in een vroeg stadium de indicatoren aan te tonen kan het ontstaan van de ziektes voorkomen worden, of kan het aantal complicaties kleiner worden of in ernst afnemen. Op de autofluorescentie meter is inmiddels een patent verstrekt. Het bedrijf Diagnoptics BV brengt de AGE reader op de markt. Malcolm Cort, assistant professor of sociology, said blacks have a high incidence of type II diabetes. Cort is studying whether there is a connection between blacks and their own acceptance of stereotypes that produces stress, and initiates an accumulation of abdominal fat associated with heart disease and type II diabetes. In a new study, scientists at The Scripps Research Institute have described for the first time a glucose activated sensor that acts as a switch to decrease production of endogenous glucose in the liver, and increase conversion of glucose to fat for storage in adipose tissue. This dual action makes the sensor, Liver X Receptor, a potential target for new therapies aimed at obesity and diabetes. The research may also have implications for heart disease and stroke. In the study, glucose is shown to stimulate the activity of the Liver X Receptors (LXR) a and b, The LXRs act as sensors of dietary components, orchestrating the body's response to nutrients such as oxysterols (short-lived derivatives of cholesterol) and controlling gene expression linked to cholesterol and fat metabolism. Michigan State University researchers have reported that chemicals found in cherries may help fight diabetes. The researchers, writing in the Jan. 5 issue of the American Chemical Societys Journal of Agricultural and Food Chemistry, said a group of naturally occurring chemicals found in abundance in cherries could help lower blood sugar levels in people with diabetes. Diabetes is a growing health problem. Giving antioxidants is recognised as one way of helping people with diabetes to control their blood sugar levels. The herbal medicine extracted from seeds of the Milk Thistle, Silybum marianum (silymarin) is known to have antioxidant properties and research published this week in Phytotherapy Research shows that this extract can help people significantly lower the amount of sugar bound to haemoglobin in blood, as well as reducing fasting blood sugar levels. Silymarin contains a number of active constituents called flavolignans which are also used to help protect the liver from poisoning. Type 2 Diabetes is a social disease, caused by environments high in stress and sugar, low in opportunities to move or to feel good about ourselves. But peoples genes or behavior are blamed for causing diabetes, and we are expected to deal with it as individuals. This isnt fair and doesnt work. People who have enough power  money, education, self-confidence, self-esteem and social support  can sometimes resist the unhealthy environment and stay well. But people with less power have more stress and harder lives, which lead to more sickness, especially Type 2 diabetes and heart disease. We need social approaches  bringing people together to increase Personal Power (self-confidence, support, sense of hope, positive goals, self-esteem) and Social Power (working together to change behavior, environments and lives.) This isnt just about diabetes. Its about individuals, families, and communities bringing wellness into their lives and helping to heal sick societies. New study reveals that ACE inhibitors reduce kidney disease risk in people with diabetes. Angiotension converting enzyme (ACE) inhibitors are used to treat high blood pressure. Now a report from researchers in Bergamo, Italy, shows that ACE inhibitors reduce the risk of kidney disease in people with diabetes, independent of their effect in lowering blood pressure. People suffering from workplace stress or job burnout seem to be more likely to develop diabetes. Job burnout and workplace stress can have an adverse effect on physical and mental health. Now researchers at Tel Aviv University, Israel, reveal that diabetes may be one of the conditions brought on by stress. Two medical studies reveal that people who consumed the most magnesium in their diets were less likely to develop type 2 diabetes. According to Dr. Simin Liu of the Harvard Medical School and School of Public Health in Boston, there is direct evidence that greater intake of dietary magnesium may have a long-term protective effect on lowering risk. "The take-home message for the public is that a diet rich in plant-based foods such as nuts, whole grains and vegetables that are high in magnesium may be beneficial for prevention," Liu said. Increased risk of non-insulin-dependent diabetes mellitus in elderly hypertensive subjects. The data presented suggest that the increased risk of non-insulin-dependent diabetes mellitus in hypertensive subjects taking beta-blockers or diuretics, or both, is explained at least partly by metabolic disturbances related to drug therapy. University of Kuopio, Department of Medicine, Finland. Antihypertensive drugs as predictors of type 2 diabetes among subjects with impaired glucose tolerance. The rate of progression from IGT to Type 2 diabetes in this population was similar to that seen in other studies among Caucasian populations. The use of antihypertensive medication, especially diuretics, and a high 2-h OGTT level were significant predictors of subsequent deterioration to diabetes. Diabetes mellitus in treated hypertension: incidence, predictive factors and the impact of non-selective beta-blockers and thiazide diuretics during 15 years treatment of middle-aged hypertensive men in the Primary Prevention Trial Goteborg, Sweden. The relative risk for developing diabetes mellitus was significantly higher in the beta-blocker group being 6.1 after 10 years and 3.5 after 15 years treatment in comparison with the thiazide group. Department of Nephrology, Sahlgrenska Hospital, Sweden. Our findings suggest a significant inverse association between magnesium intake and diabetes risk. This study supports the dietary recommendation to increase consumption of major food sources of magnesium, such as whole grains, nuts, and green leafy vegetables. Diabetes type 2 is gerelateerd aan overgewicht en komt tegenwoordig veel voor. Bij deze vorm van diabetes ontstaat er een verminderde gevoeligheid voor insuline. Annemieke Heijboer en Anita van den Hoek onderzochten of gevoeligheid voor insuline beinvloedt wordt door de verschillende darmhormonen en neuropeptiden die betrokken zijn bij de regulatie van voedselinname. Met hun onderzoek toonde zij aan dat het darmhormoon PYY via de hersenen insuline gevoeligheid kan verhogen. Deze conclusie geeft een belangrijke aanknoping voor de ontwikkeling van medicijnen tegen type 2 diabetes. There is an association between thinness in infancy and the presence of impaired glucose tolerance or diabetes in young adulthood. Crossing into higher categories of body-mass index after the age of two years is also associated with these disorders. Suikerziekte en hart- en vaatziekten behoren wereldwijd tot de meest voorkomende chronische ziekten. Meer dan 10 miljoen mensen in Europa hebben suikerziekte. Veel pati�nten die de ziekte op middelbare leeftijd krijgen, kunnen de symptomen onder controle houden door op te letten wat ze eten. Jonge mensen hebben vaak een ernstiger vorm van suikerziekte, die dodelijk kan zijn als ze niet geregeld injecties met insuline krijgen. Alle vormen van suikerziekte kunnen, zelfs als ze goed behandeld worden, op langere termijn tot slopende gezondheidsproblemen leiden. Ten gevolge van suikerziekte (diabetes mellitus) kunnen er beschadigingen optreden binnen in het oog. Zonder dat al direct het zien wordt aangetast kunnen er toch afwijkingen aanwezig zijn in het netvlies. Men noemt dit diabetesche retinopathie. Wanneer deze schadelijke afwijkingen niet tijdig worden onderkend en behandeld kan blindheid het gevolg zijn. Meer dan 850.000 Nederlanders lijden aan diabetes mellitus, ofwel suikerziekte. Maar lieft zo'n 400.000 mensen hebben op dit moment diabetes maar weten dit nog niet. Jaarlijks komen er 65.000 nieuwe diabetesgevallen bij.Deze ziekte wordt veroorzaakt door een tekort aan insuline. Diabetes pati�nten volgen een dieet en/of injecteren zichzelf met insuline. Suikerpati�nten zijn over het algemeen altijd te behandelen, maar wie eenmaal diabetes heeft komt er nooit meer vanaf. Wij zetten ons in voor het zoeken naar oplossingen voor diabetes en de complicaties van diabetes. Met het doel deze ziekte te voorkomen en te genezen. Dat lukt alleen als we weten hoe diabetes ontstaat en hoe het zich ontwikkelt. Wetenschappelijk onderzoek moet daarop de antwoorden geven. Ieder jaar financiert het Diabetes Fonds een aantal belangrijke onderzoeksprojecten. Die gaan niet alleen over hoe diabetes kan worden voorkomen, maar ook hoe diabetes beter kan worden behandeld. Dat is iets waar pati�nten nu al profijt van hebben. Daarnaast stimuleren we jonge wetenschappers om onderzoek naar diabetes te gaan doen. Diabetes, voluit diabetes mellitus, is een stofwisselingsziekte. Het lichaam is niet meer in staat om zelfstandig suikers, oftewel glucose, uit voeding te verwerken. Dat komt omdat er te weinig of geen insuline wordt aangemaakt. En insuline is nodig voor het transport van glucose uit het bloed naar de lichaamsweefsels. Geen mens kan zonder glucose, want deze stof geeft het lichaam energie waardoor alle spieren en organen werken. Dag en nacht. Naast die problemen met de glucosehuishouding is ook de vetstofwisseling uit balans. Kaneel kan bij mensen met type 2 diabetes positief werken op de glucose- en vethuishouding. Dat zeggen onderzoekers uit Pakistan nadat ze de effecten van kaneel bestudeerden bij zestig proefpersonen. Hun bloedglucose daalde met gemiddeld 25%. Datzelfde verbeteringspercentage vonden ze op bepaalde punten in de vetstofwisseling. Wetenschappers en de voedingsindustrie onderzoeken de mogelijkheden van een wortel uit Peru, de yacon, als suikervervanger. De wortel is even zoet als suiker maar doet het bloedglucosegehalte niet stijgen. Hij bevat geen calorie�n, want omdat hij voornamelijk uit zogeheten oligofructose bestaat, neemt het lichaam de stof niet op. De wortel wordt al ge�xporteerd naar Japan. De Vlaamse Diabetes Vereniging (VDV) is een organisatie, die zich inzet voor mensen met diabetes mellitus (suikerziekte). De vereniging telt bijna 19 000 leden, waaronder niet alleen mensen met diabetes, hun familieleden of vrienden, maar ook geneesheren, verpleegkundigen, di�tisten, podologen en wetenschappers, die beroepshalve met diabetes bezig zijn. De samenwerking tussen diabetici en professionelen geeft de VDV extra diepgang en slagkracht! MijnDiabetes is een SMS en internetplatform voor jongeren tussen de 12 en 18 jaar. Daarnaast kunnen medisch professionals met MijnDiabetes communiceren met de jongeren middels het sturen van SMS-berichten. Het diabetescentrum VUmc is een multidisciplinair behandelcentrum voor volwassenen en kinderen met diabetes, gespecialiseerd in complexe medische en psychosociale problematiek. Deze site biedt informatie over de aandoening zelf, de invloed op het dagelijks functioneren -ook voor personen in de directe omgeving-, de behandeling en wetenschappelijk onderzoek. Uit deze koolhydraten wordt in ons lichaam glucose gevormd. Glucose dient als brandstof om bijvoorbeeld te kunnen lopen, praten, denken. Ieder mens heeft glucose in het bloed. Men noemt dit ook wel bloedsuiker. Bij mensen met diabetes is het bloedglucosegehalte meestal te hoog. Dit betekent niet dat iemand met diabetes mellitus geen koolhydraten moet eten. In een evenwichtig samengestelde voeding (en niet alleen voor diabeten!) nemen koolhydraten een belangrijke plaats in. Een magazine voor mensen met diabetes die alles willen weten over bloedglucosemeters, insulinepennen insulinepompen, achtergronden van de industrie, interviews en hoe u nog steeds prettig kunt leven met diabetes. Kinderdiabetes.nl is een website voor en door mensen die op de een of andere manier te maken hebben met kinderdiabetes. Dit kan zijn in een familie situatie, profesioneel of gewoon een interesse in dit onderwerp. Doel is contact te leggen, en elkaar te helpen om kinderen een zo prettig mogelijk bestaan te geven. Dit doormiddel van Forums, artikelen plaatsen en tips te geven. Iedere deelname aan deze site wordt zeer op prijs gesteld, een simpele inbreng kan voor een andere bezoeker een wereld van verschil betekenen. De DVN (Diabetesvereniging Nederland) behartigt de belangen van alle mensen met diabetes en ondersteunt hen in hun streven een normaal en actief leven te leiden. Daarom organiseert de DVN onder andere schriftelijke en mondelinge cursussen, gespreksavonden en symposia en geeft -individuele- voorlichting in de breedste zin van het woord. Werkgroepen zetten doelgroepgerichte activiteiten en informatieve bijeenkomsten op touw. Verspreid over het land bevinden zich ongeveer 275 Diabetes Informatie Posten (DIP's). Deze worden bemand door ervaringsdeskundigen die mensen met diabetes en de mensen in hun directe omgeving met raad en daad terzijde kunnen staan. Het streven van al deze initiatieven is om mensen met diabetes zodanig op weg te helpen dat ze hun behandeling grotendeels in eigen hand kunnen nemen (uiteraard met een team van artsen en deskundigen achter zich). Bloedsuiker is een 4 jaarlijks-blad speciaal voor mensen met diabetes, mogelijk gemaakt door Novo Nordisk en Lifescan. De Bosman Junior City is speciaal gemaakt voor kinderen en tieners met diabetes. Op de site is veel informatie te vinden over het hebben van diabetes en hoe je daarmee om kunt gaan, maar je kunt ook chatten met andere kinderen/tieners zodat je gemakkelijk tips en informatie van elkaar kunt ontvangen. DiabetesDirect is in augustus 1995 opgericht onder de naam Total Diabetes Management (TDM). Het is tot 31 december 2000 een dochterbedrijf geweest van insulinefabrikant Eli Lilly Nederland BV. Vanaf 1 januari 2001 is de naam TDM veranderd in DiabetesDirect en is het bedrijf een zelfstandige onderneming geworden. Uitgangspunt van DiabetesDirect is het maken van een optimale winst in plaats van een maximale winst. Hierdoor is er extra geld beschikbaar dat gebruikt wordt om mee te werken aan het verder verbeteren van de diabeteszorg in Nederland. Samen met verschillende zorgverleners spannen wij ons in om projecten op te zetten die de kwaliteit van de Nederlandse Diabeteszorg ondersteunen. DiabetesDirect conformeert zich hierbij altijd aan de richtlijnen van St. Vincent die als doel hebben, het terugdringen van de gevolgen van lange termijn complicaties bij diabetes mellitus. Een site van de DVN voor en over jongeren met diabetes. Deze site is een initiatief van een aantal vrijwilligers, die bij het zoeken naar een nieuwe bloedglucosemeter merkten dat er vrijwel geen onafhankelijke informatie te vinden is. Deze site beschikt over allerlei nuttige, heldere informatie over het onderwerp Diabetes Mellitus. De Nederlandse Diabetes Federatie (NDF) is een in 1995 opgerichte vereniging. Binnen de NDF werken mensen met diabetes, behandelaars en wetenschappers gezamenlijk aan de verbetering van de diabeteszorg in Nederland. Samen werken aan goede diabeteszorg, waarbij de mens met diabetes centraal staat. De doelstellingen van de NDF zijn uiteengezet in het Beleidsplan 2001-2006: 'Goede diabeteszorg voor iedereen: "van papieren richtlijnen naar dagelijkse praktijk". De NDF opereert inhoudelijk onafhankelijk en wil aanspreekpunt zijn voor overheden en zorgverzekeraars en tegelijk een breed platform voor allen, die direct of indirect betrokken zijn bij de zorg voor de mens met diabetes. Het doel van de EADV is het bevorderen van de kwaliteit van diabeteszorg door diabetesverpleegkundigen en het behartigen van de gemeenschappelijke belangen van de bij haar aangesloten leden in de meest ruime zin van het woord. In 1996 is de DiHAG (Diabetes Huisartsen Adviesgroep) opgericht om ervoor te zorgen dat de diabeteszorg onder verantwoordelijkheid van de huisarts verder aan kwaliteit kan winnen. De oprichters waren zich ervan bewust, dat daarvoor niet alleen goede richtlijnen nodig zijn, maar ook voldoende ondersteunend personeel en een passende financi�le vergoeding. Inmiddels vertegenwoordigt de DiHAG  in nauw overleg met het NHG en de LHV  de huisartsen binnen de Nederlandse Diabetes Federatie, het unieke samenwerkingsverband waarin al langer de mensen met diabetes (DVN) met internisten, huisartsen, diabetesverpleegkundigen en dietisten samenwerken. Internetsite van de Turkse diabetesvereniging. Informatie in het Turks en Engels. De DiabetesApotheek is een apotheek die zich gespecialiseerd heeft in de dienstverlening naar mensen met diabetes. Wij combineren de vertrouwde diensten van de apotheek met de voordelen van de hulpmiddelen-leveranciers. U kunt bij ons terecht voor informatie over en bestelling van insulines, hulpmiddelen en andere geneesmiddelen. De DiabetesApotheek is het betrouwbare en deskundige adres voor uw medicijnen en andere benodigdheden. DiaCare pati�ntenzorg, de specialist op het gebied van hulpmiddelen voor zelfcontrole bij diabetes mellitus. DiaCare is een postorderbedrijf met een breed en diep assortiment. Uitganspunt van DiaCare is snel, adequaat en tegen een scherpe prijsstelling u te voorzien van alle voor u noodzakelijke denkbare diabetes hulpmiddelen. Suikerziekte is geen zeldzaam verschijnsel bij katten, Je treft dit het meest aan bij oudere katten (10jr. & ouder) en zwaarlijvige katten. Suikerziekte wordt veroorzaakt doordat het lichaam (de alvleesklier) te weinig insuline aanmaakt, insuline is een hormoon wat er voor zorgt dat het lichaam de suiker op een juiste manier kan opnemen. Doordat het lichaam de suiker niet kan opnemen gaat de kat zich erg beroerd voelen en krijg je een verhoogde concentratie suiker in het bloed. het lichaam gaat als gevolg de suiker via de urine 'lozen' wat meer plassen en dus ook meer drinken tot gevolg heeft. Bovendien zal de kat door het enorme suiker tekort in zijn organen meer gaan eten. Mechelse verpleegster helpt zieke kinderen in haar geboorteland. Een van de gelauwerden van de Stichting Roeping is Mahjouba Hamddan Lachkar (30). Deze verpleegster spendeert al haar vrije tijd om Marokkaanse kinderen met suikerziekte een betere behandeling te garanderen. "Anders dreigt voor velen blindheid of zelfs de dood." Het eten van noten verkleint de kans op het ontwikkelen van diabetes 2. Ook koffie vermindert het risico op suikerziekte. Tot die conclusie komen Amerikaanse en Nederlandse wetenschappers. Zij hebben over hun werk gepubliceerd in the Journal of American Medical Association en de Lancet. Type 1 of IDDM (Insuline Dependente Diabetes Mellitus) of juveniele diabetes dat 15 % van de diabetesgevallen vertegenwoordigt. Type 2 of NIDDM (Non Insuline Dependente Diabetes Mellitus) of ouderdomsdiabetes dat 85 % van de gevallen omvat. Suiker, in een koekje of in een klontje, behoort tot de zogenaamde "snelle suikers". Zij worden direct door het lichaam opgenomen, hierdoor stijgt het glucose-niveau in ons bloed zeer snel. Dit dwingt de pancreas om snel een grote hoeveelheid insuline aan te maken, waardoor de glucose door de lichaamscellen opgenomen kan worden en het glucose-niveau weer daalt. Bovendien is de insuline voor de lever een signaal om het te veel aan glucose op te slaan als glycogeen (vet). Door dit proces daalt het glucose-niveau in het bloed nog sneller. Een overmatige consumptie van snelle suikers is een grote belasting voor de pancreas. De pancreas leert op deze manier dat er altijd snel en met een grote hoeveelheid insuline moet worden gereageerd, hierdoor ontstaan grote schommelingen in het glucose-niveau; een reeks van klachten zijn het gevolg: moeheid, meer zoetbehoefte, ge�rriteerdheid, trillen. Bij suikerziekte wordt er door het eigen afweersysteem een vergissing gemaakt. Het doelwit van het zich vergissende afweersysteem zijn de Betacellen in de eilandjes van Langerhans. Deze kleine eilandjes maken insuline. Jan van Keulen uit Hasselt heeft een internetsite geopend met informatie over de dorstziekte diabetes insipidus. Van Keulen - zelf pati�nt, evenals zijn zoon - heeft inmiddels ruim 700 bezoekers kunnen verwelkomen. De meeste komen uit Nederland, maar ook internetters in Belgi�, Verenigde Staten, Suriname, Japan en Portugal hebben de site inmiddels weten te vinden. Mensen die lijden aan de zeldzame ziekte Neurogene Diabetes Insipidus leven in de ban van de dorst en proberen deze te lessen door steeds vocht tot zich te nemen. Ze vinden dat vaak zelf zo normaal dat ze het helemaal niet als een aandoening zien. Dat is het echter wel degelijk, met zelfs levensgevaarlijke kantjes. Toch is er vrij eenvoudig iets aan te doen. Groot probleem was altijd om de ziekte aan te tonen. De medische wetenschap had tot voor kort alleen de dorstproef, maar die is voor de pati�nt een regelrechte marteling. De Isala klinieken (locatie Sophia) in Zwolle zorgde voor een doorbraak. Na uitgebreid onderzoek werd in het laboratorium een methode ontwikkeld die het in veel gevallen mogelijk maakt met een simpele bloedproef uitkomst te brengen. Hier vindt u uitgebreide informatie over het meten en controleren van bloedsuikerspiegels en wat daarbij komt kijken. LifeScan staat aan de top op het gebied van apparatuur voor het meten van het bloedglucosegehalte voor thuis- en hospitaalgebruik. De kennis en ervaring die wij hebben, stellen wij graag ten dienste van mensen met diabetes en hun familieleden. Van belang is dat de toegestane hoeveelheid koolhydraten gelijkelijk over de maaltijden wordt verdeeld. Als men niet genoeg heeft aan het dieet dan neemt men maar eens vaker verschillende soorten groentes en salades met een laag gehalte aan koolhydraten, zoals komkommer, zuurkool, tomaten, asperges, jonge groene bonen, witte- en rode kool, bloemkool, raapjes, groene kool, bieten, spinazie, spruitjes, paddestoelen, sla, waterkers, andijvie, witlof en andere salades. Melkfermenten activeren de alvleesklier. Daarom is wei (molkosan) een goed middel voor diabetici. Het dagelijks drinken van een eetlepel wei op een glas water is aan te bevelen. Men kan de wei ook goed gebruiken bij het aanmaken van salades. Het dagelijks gebruik van wei zal in combinatie met een goed dieet de suikerspiegel van het bloed doen dalen en de afscheiding via de urine zal minder worden. Gewone suiker heeft een slechte reputatie. Teveel suikers veroorzaken stofwisselingsziekten en be�nvloeden daarmee de hersenen, het gedrag en de weerstand. Daarbij is een groot deel van de bevolking vatbaar voor jeugd- en prediabetes. Veel snoepen (en overgewicht) geeft, net als roken, een groot risico om suikerziekte te krijgen (dat geldt in sterkere mate voor kinderen). Suikerziekte bij kinderen neemt steeds meer toe. Al in het voorstadium van suikerziekte blijkt ernstige schade te ontstaan: Het metabolisme raakt aangetast, de nieren kunnen het niet meer aan, de hersenen krijgen teveel gifstoffen te verwerken, huid- en zenuwschade ontstaat. Recent Amerikaans onderzoek (CNN, 4-2-2003) toont een directe relatie aan tussen geheugenverlies, hersenverschrompeling en hoge bloedsuikerniveaus. Tandbederf door suikers is een bron van chronische ziekten elders in het lichaam (maar tandbederf wordt ook veroorzaakt door suikervrij eten en drinken, en heeft meer met hygi�ne te maken). Op deze site vind u veel praktische en begrijpelijke informatie over o.a. de vormen,de verschijnselen, het diagnostiseren,de behandeling en het voorkomen van de complicaties van Diabetes Mellitus. Nieuwe ontwikkelingen en beschikbare informatie hieromtrent zal worden opgenomen op deze site. Een deel van de medische informatie op deze site is door Proff. Dr.B.H.R.Wolffenbuttel,internist-endocrinoloog beschikbaar gesteld. Hypoglykemie betekent letterlijk "een te lage bloedsuikerspiegel". De bloedsuikerspiegel is een uitdrukking waarmee de hoeveelheid suiker in het bloed wordt aangeduid. De bloedsuikerspiegel hoort binnen bepaalde waarden te blijven; duikt de bloedsuikerspiegel onder de laagste normale waarde dan spreekt men van hypoglykemie. Mensen die regelmatig te lage bloedsuikerwaarden hebben krijgen gezondheidsklachten doordat een aantal systemen in het menselijk lichaam niet meer goed kunnen functioneren. Hypoglykemie betekent eigenlijk dat de bloedsuikerspiegel voortdurend te laag is. Dit komt echter nauwelijks voor: de meeste mensen gebruiken de benoeming "hypoglykemie" om er "glucose-intolerantie" mee aan te duiden. Wanneer iemand last heeft van glucose-intolerantie schommelt de bloedsuikerwaarde sterk en kan zowel te lage als normale of vaak zelfs te hoge bloedsuikerwaarden bereiken. Van deze te hoge bloedsuikerwaarden merken we niet zo erg veel, maar wel van de te lage bloedsuikerwaarden en de sterke schommelingen. Vaak wordt glucose-intolerantie dan ook als hypoglykemie gediagnostiseerd. Problematisch is dat niet omdat deze twee aandoeningen op dezelfde manier kunnen worden behandeld. Op 1 januari 1998 is de Wet op de medische keuringen (WMK) in werking getreden. De WMK stelt beperkingen aan bepaalde medische keuringen. Aanstellingskeuringen mogen bijvoorbeeld alleen worden verricht, als het voor het vervullen van de functie noodzakelijk is dat de werknemer aan een bepaalde eis of eisen van medische geschiktheid voldoet. Zo kan een aanstellingskeuring geoorloofd zijn wanneer aan het verrichten van de functie risico's verbonden zijn voor de gezondheid of de veiligheid van de werknemer. De WMK versterkt de rechtspositie van de keurling; bij de aanstellingskeuring is dit de sollicitant. Hindostanen hebben een verhoogd risico om suikerziekte te krijgen. Dat geldt niet alleen voor Nederland. In Suriname, Guyana, Trinidad, Engeland en andere diasporalanden waar hindostanen zich hebben gevestigd is het net zo erg. Reeds 10 jaar geleden maakte een publicatie van de Wereldgezondheidszorg (WHO) bekend dat India het hoogste percentage diabeten heeft. Bijna elke hindostaan in Nederland heeft in de naaste familie iemand die lijdt aan of is overleden aan de complicaties van deze ziekte. EyeCheck levert een unieke service aan mensen met diabetes mellitus, zodat zij op een gemakkelijke en snelle manier toegang hebben tot een professionele netvlies-controle (screening). Deze unieke service is ontwikkeld door oogartsen en beeldverwerkings experts. De Alvleeskliervereniging werd opgericht op 29 december 1997. De vereniging wil zich inzetten voor mensen met een aandoening aan de alvleesklier (pancreas) en al datgene wat met deze ziekte in verband staat. Een andere belangrijke functie is het bij elkaar brengen van lotgenoten. Juist omdat het een aandoening is die niet veel voorkomt, is er veel onbekendheid en weinig begrip van de omgeving. Voor alle vormen van diabetes mellitus geldt dat personen bij wie plotseling en onverwacht dalingen in het bewustzijn optreden door hypoglycaemie, zonder meer ongeschikt zijn voor alle rijbewijzen. Ook zijn in het algemeen die personen ongeschikt, bij wie de ziekte gepaard gaat met ernstige complicaties van ogen, zenuwstelsel of hart en bloedvaten. Onze stichting zamelt de gebruikte kleding huis-aan-huis in en heeft tevens kledingcontainers geplaatst bij sportverenigingen. Alle kleding die wij ophalen wordt verkocht aan landen in Oost-Europa. De netto-opbrengst is geheel bestemd voor het Diabetes Fonds Nederland, gevestigd te Amersfoort. Dit fonds wendt de gelden voornamelijk aan voor onderzoek. De snoepjes van DE BRON zijn geschikt voor mensen met suikerziekte. Suiker beinvloedt de glucose spiegel in het bloed. Het glucosegehalte wordt door het lichaam door middel van insuline op peil gehouden. Dit werkt niet voldoende bij een suikerpati�nt, de insuline wordt onvoldoende aangemaakt door de alvleesklier. Wat is nu het geheim van de DE BRON snoepjes? In plaats van suiker bevatten ze suikervervangers zoals Maltitol, Isomalt en Lactitol. Deze behoren tot de scheikundige groep van Polyolen. De prettige eigenschap van Polyolen is dat deze niet omgezet worden naar glucose, dus is er ook geen insuline nodig om het glucosegehalte op peil te houden. Ideaal voor suikerpati�nten. De Nederlandse Vereniging voor Diabetesonderzoek (NVDO) bestaat al sinds 1974. De NVDO is een vereniging van artsen en andere specialisten op het gebied van onderzoek en behandeling van diabetes mellitus. De belangrijkste taak van de vereniging is het stimuleren van het wetenschappelijk onderzoek op het gebied van diabetes mellitus en het in de praktijk toepassen van de hierbij verkregen resultaten. Bent u ook zo'n zoetekauw, maar mag u om gezondheidsredenen geen suiker of wilt u gewoon minderen in het gebruik van suiker? Dan bent u bij ons aan het juiste adres. Prodia staat voor een assortiment koekjes, zoet broodbeleg (jam, hazelnootpasta), chocolade, snoepjes en sauzen zonder toevoeging van suiker. Prodia producten worden uitsluitend gezoet met veilige suikervervangers. Bij suikerintolerantie schommelen de bloedsuikerwaarden, van te hoog tot te laag. De alvleesklier produceert iedere keer als er suiker in je lichaam komt, teveel insuline. Daardoor zakt je bloedsuiker te snel. De bijnieren, die bij een te laag gehalte glucose vrij moet maken, kunnen dit tempo niet (meer) bijhouden en zo blijft het tekort aan bloedsuiker ontstaan. Je lichaam 'schreeuwt' als het ware om suiker en geef je daaraan toe, dan begint het proces opnieuw. Ook stress be�nvloedt dit proces, doordat de bijnieren onder stress de hormonen adrenaline en cortisol afgeven, die weer het glucose-gehalte in je bloed verhogen, en zo gaat het maar door. Hypoglycemie betekent letterlijk "een te lage bloedsuikerspiegel". Vaak gebruikt men de term hypoglycemie om er suikerintolerantie mee aan te duiden. Een constant te lage bloedspiegel komt echter nauwelijks voor, mensen met suikerintolerantie hebben wel vaker een te lage, dan te hoge bloedsuikerspiegel. De behandeling van beide aandoeningen is echter hetzelfde. Op deze site vindt u informatie over diabetes en erectieproblemen. Deze combinatie is niet zo maar gemaakt want erectieproblemen zijn een gevolg van diabetes. Dat is een probleem want de meerderheid van mannen en hun partners vindt seksualiteit belangrijk (NIPO onderzoek). Uw huisarts zal een belangrijke rol spelen in het bereiken van de oplossing. Hij vindt erectieproblemen net zo moeilijk bespreekbaar als u.
Ongeveer 2 - 3% van alle zwangere vrouwen worden tijdens hun zwangerschap geconfronteerd met diabetes. Het is mogelijk dat een vrouw, die nooit verhoogde bloedsuikers had, toch diabetes ontwikkelt tijdens de zwangerschap. MeMO is specialist op het gebied van diabetes hulpmiddelen en levert een volledig assortiment diabetes hulpmiddelen van alle bekende merken. Van bloedglucose meters tot lancetten, van teststrips tot insulinepomp toebehoren, van injectienaalden tot infuuspleisters. Daarnaast wordt het assortiment doorlopend uitgebreid met aanverwante artikelen, zoals alcoholdoekjes, reistasjes (Organizer, Fr�o), huidverzorgingsproducten (Dermal Therapy), voedingssupplementen (Orthica) en bijvoorbeeld een bloeddrukmeter. Reports of a traditional Chinese medicine having beneficial effects for people suffering from type 2 diabetes now has some scientific evidence to back up the claims. A collaboration between Chinese, Korean, and Australian scientists at Sydney's Garvan Institute, has revealed that the natural plant product berberine could be a valuable new treatment. Berberine is found in the roots and bark of a number of plants used for medicinal purposes including wound healing and treatment of diarrhoea. It has also been documented in Chinese literature as having a glucose lowering effect when administered to people with diabetes; yet, until now, its mode of action was unknown. Garvan scientist Dr Jiming Ye says: "Our studies in animal models of diabetes show that berberine acts in part by activating an enzyme in the muscle and liver that is involved in improving sensitivity of the tissue to insulin  this in turn helps lower blood sugar levels. In addition, it seems berberine can help reduce body weight". Current medicines for treating type 2 diabetes include metformin and the TZD group of drugs. However, a large number of patients cannot tolerate metformin and the TZDs can cause undesirable weight gain. Therefore, it is critical to develop new therapies to treat type 2 diabetes, which is a growing health problem. "Berberine has been used for decades, if not centuries, with few reported side effects. Given the limitations of existing medicines we are excited to have evidence that berberine may be a helpful new treatment for type 2 diabetes; however, despite its widespread use in traditional medicine practices, it will still have to be evaluated properly following the defined clinical trials process", said Professor James, head of the Garvan's Diabetes & Obesity Research Program and co-author of the Diabetes paper. The next step is to investigate how berberine activates the enzyme that mediates these 'insulin-sensitising' effects. Hodgson JM, Watts GF, Playford DA, Burke V, Croft KD. University of Western Australia Department of Medicine and HeartSearch, Royal Perth Hospital, Perth, Western Australia, Australia. OBJECTIVE: Our objective was to assess effects of dietary supplementation with coenzyme Q10 (CoQ) on blood pressure and glycaemic control in subjects with type 2 diabetes, and to consider oxidative stress as a potential mechanism for any effects. CONCLUSIONS: These results show that CoQ supplementation may improve blood pressure and long-term glycaemic control in subjects with type 2 diabetes, but these improvements were not associated with reduced oxidative stress, as assessed by F2-isoprostanes. SPONSORSHIP: This study was supported by a grant from the NH&MRC, Australia. The association between magnesium deficiency and IR is present during childhood. Serum magnesium deficiency in obese children may be secondary to decreased dietary magnesium intake. Magnesium supplementation or increased intake of magnesium-rich foods may be an important tool in the prevention of type 2 diabetes in obese children. Coenzyme Q10 and diabetic endotheliopathy: oxidative stress and the 'recoupling hypothesis'. Chew GT, Watts GF. School of Medicine and Pharmacology, University of Western Australia, Royal Perth Hospital Unit, GPO Box X2213, Perth, Western Australia, Australia 6847. Increased oxidative stress in diabetes mellitus may underlie the development of endothelial cell dysfunction by decreasing the availability of nitric oxide (NO) as well as by activating pro-inflammatory pathways. In the arterial wall, redox imbalance and oxidation of tetrahydrobiopterin (BH4) uncouples endothelial nitric oxide synthase (eNOS). This results in decreased production and increased consumption of NO, and generation of free radicals, such as superoxide and peroxynitrite. In the mitochondria, increased redox potential uncouples oxidative phosphorylation, resulting in inhibition of electron transport and increased transfer of electrons to molecular oxygen to form superoxide and other oxidant radicals. Coenzyme Q10 (CoQ), a potent antioxidant and a critical intermediate of the electron transport chain, may improve endothelial dysfunction by 'recoupling' eNOS and mitochondrial oxidative phosphorylation. CoQ supplementation may also act synergistically with anti-atherogenic agents, such as fibrates and statins, to improve endotheliopathy in diabetes. Diabetes in Indigenous Australians occurs at a younger age and at almost four times the rate in non-Indigenous Australians. The age-adjusted prevalence of diabetes among Indigenous people is 16% in remote areas and 9% in non-remote areas, with the actual prevalence estimated to be between 20% and 25%, and possibly higher than 30% in some remote areas.1 The cause for this disparity in diabetes incidence is multifactorial, and recent evidence suggests that nutrition  particularly magnesium intake  may play a role. Scientists at Oxford and Manchester Universities have got first sight of the structure of a protein that is important for type-2 (adult onset) diabetes. The research, published in the European Molecular Biology Organization Journal, will not only give a greater understanding of the disease but may lead to better treatments. Professor Frances Ashcroft, who led the Oxford team that isolated the protein said: Diabetes is a big problem in Western societies. It affects 1.5 million people in the UK and is set to become even worse because the population is getting more obese. We have managed to produce the first three-dimensional picture of this protein, said Professor Robert Ford, the structural biologist leading the research in Manchester. Its a very complicated beast: it actually comprises eight different proteins cooperating together in a large, complex structure. The protein, called the K-ATP channel, is essential for the beta-cells of the pancreas to release the hormone insulin. Diabetes results when not enough insulin is released to meet the body's demands. The K-ATP channel protein is the target for anti-diabetic drugs that are taken by millions of type-2 diabetics every day. They work by blocking the protein's function, which leads to insulin release. Mutations in the genes that code for the K-ATP channel result in changes in the protein's structure and cause babies to be born with diabetes. Patients with diabetes are receiving a cutting edge treatment in Oxford which could end their dependence on insulin injections, thanks in part to research at Oxford University, backed up by a new state-of-the-art facility opening today at the Churchill Hospital, part of the Oxford Radcliffe Hospitals. The new facility, based in the Oxford Centre for Diabetes, Endocrinology and Metabolism, has been built with a �1.2 million grant from the Diabetes Research and Wellness Foundation (DRWF). The award was made to the Nuffield Department of Surgery, whose researchers are spearheading the cure for insulin-dependent diabetes. The technique, many aspects of which were originally pioneered by researchers from Oxford University and more recently optimised by the team in Edmonton in Canada, allows surgeons to transplant islets, the clusters of cells in the pancreas which produce insulin, into patients with type I diabetes. Currently, patients can have regular injections of insulin which keep symptoms of diabetes at bay but do not necessarily prevent serious complications in later life such as blindness, kidney failure, and heart disease. Alternatively, patients can undergo a whole pancreas transplant, which is very successful in adults, but involves a major operation not suitable for children. The new technique, currently in adult human trials, involves extracting pancreatic islets from the pancreases of organ donors and injecting them directly into a patients liver using X-ray to guide the needle. After a successful transplant, patients produce their own insulin in exactly the same way as people without diabetes, and are freed from dependence on daily insulin injections. The aim is to be able to offer this treatment to children within the next five to ten years. Lab technicians must wash and change into scrubs just as a surgeon would before entering the first room, but to enter the last room in the chain, they have to don a full body suit which allows no part of their body to come into contact with the surroundings. An incoming pancreas would progress through the rooms, being passed from one to the other through airlocks, progressing through the various stages of preparation necessary for islet extraction. The extraction itself takes between four and six hours. First an enzyme is injected into the donated pancreas, which separates the surrounding pancreatic tissue from the islets and breaks it down to make a pancreas digest (a sort of pancreas soup). This is then put through a process called density separation until a sufficient number of pure islets can be recovered. Another crucial aspect of the research within Oxford is investigating ways to prevent recipients rejecting the donated islets. Adults can be given drugs that suppress their immune system, but the long-term use of these drugs in children would have significant complications. There are various ways that could be used to get round this problem, such as manipulating the recipients T-cells (cells that play a crucial role in the immune response), using artificially created capsules in which the islets sit, or modifying the islets themselves. The goal is to be able to perform islet transplants without the need for any anti-rejection drugs. The team is also investigating the possibility of creating islets from adult stem cells or genetically modified animal cells. Scientists have linked a protein to regulation of the body's use of the sugar glucose. In the process, they illustrated the protein's potential as a target for new drugs to treat diabetes and obesity. After screening hundreds of compounds for their effects on fat development, researchers have discovered that an ingredient found in some plants fights diabetes in mice without some of the side effects attributed to other antidiabetes drugs. The chemical they pinpointed, known as harmine, was first isolated more than 150 years ago from plants traditionally included in ritual and medicinal preparations around the world. Growing old can be disheartening. But for people with diabetes, the aging process can be downright depressing. A University of Florida study published this week in the Archives of Internal Medicine reveals that older adults diagnosed with the type 2 form of the disease are twice as likely as their peers to suffer from depression. A new study appearing in the current issue of the peer-reviewed Journal of Nutrition shows that consuming grapes protected against the destruction of insulin-producing cells (known as beta cells) in the pancreas, significantly reducing the incidence of diabetes in lab rodents. Naturally occurring antioxidants in grapes known as polyphenols are believed to be responsible for this beneficial impact. A new study shows that people who had the most fiber from whole-grain cereals in their diet had a 27 percent lower risk of developing type 2 diabetes than those who ate the least. Foods that have a high glycemic index include potatoes, refined foods such as white bread, white rice, refined cereals (corn flakes, Cheerios), white spaghetti, and sugar. Foods with a low glycemic index do not raise blood sugar levels as quickly and, therefore, are associated with a lower risk of type 2 diabetes. Low glycemic index foods include legumes, whole fruits, oats, bran, and whole-grain cereals. Researchers at the University of Warwick's Warwick Medical School have uncovered a process that locks the body's metabolism in a diabetic state after only relatively limited exposure to high glucose levels. A key aspect of how embryos create the cells which secrete insulin is revealed in a new study published tomorrow in the Journal of Biological Chemistry. The researchers hope that their findings will enable the development of new therapies for diabetes, a condition caused by insufficient levels of insulin. The research reveals that glucose plays a key role in enabling healthy beta cells, which secrete insulin, to develop in the pancreas of an embryo. A glucosamine-like dietary supplement has been found to suppress the damaging autoimmune response seen in multiple sclerosis and type-1 diabetes mellitus, according to University of California, Irvine health sciences researchers. The reason 200 million Americans are overweight is not because of flawed genetics that cause them to make excessive insulin. Hypersecretion of insulin is an effect -- NOT the cause. The reason 200 million are overweight is because they have impaired insulin receptor sensitivity. Increased prevalences of diabetes mellitus have been reported among individuals chronically exposed to inorganic arsenic (iAs) . However, the mechanisms underlying the diabetogenic effects of iAs have not been characterized. We have previously shown that trivalent metabolites of iAs, arsenite (iAsIII) and methylarsonous acid (MAsIII) inhibit insulin-stimulated glucose uptake (ISGU) in 3T3-L1 adipocytes by suppressing the insulin-dependent phosphorylation of protein kinase B (PKB/Akt) . Many patients with diabetes die from diabetic ketoacidosis (DKA) every year. DKA is caused by reduced insulin levels, decreased glucose use, and increased gluconeogenesis from elevated counter regulatory hormones, including catecholamines, glucagon, and cortisol. DKA primarily affects patients with type 1 diabetes, but also may occur in patients with type 2 diabetes, and is most often caused by omission of treatment, infection, or alcohol abuse. Australian researchers believe they have found a trigger of type 1 diabetes in children - their mothers eating potatoes and other tuberous vegetables during pregnancy. Foods of the kind that were consumed during human evolution may be the best choice to control diabetes type 2. A study from Lund University, Sweden, found markedly improved capacity to handle carbohydrate after eating such foods for three months. Gestational diabetes can cause serious complications in infants. The researchers, who studied 25,000 pregnant women, found that the level of glucose currently defined as indicating gestational diabetes has been set too high. Individuals with diabetes may have a higher risk of developing mild cognitive impairment, a condition that involves difficulties with thinking and learning and may be an intermediate step toward Alzheimer's disease. It may therefore be concluded that the pulps of Aloe vera leaves devoid of the gel could be useful in the treatment of non-insulin dependent diabetes mellitus. Aloe vera and gibberellin. Anti-inflammatory activity in diabetes. Aloe vera inhibits inflammation and adjuvant-induced arthritis. The authors' laboratory has shown that A. vera improves wound healing, which suggests that it does not act like an adrenal steroid. Diabetic animals were used in this study because of their poor wound healing and anti-inflammatory capabilities. A DIET rich in black soya beans could help control weight and even prevent diabetes, according to research. The beans could also lower cholesterol levels, a laboratory study on rats found. The genome of patients with type 2 diabetes (DT2) has been elucidated, for the first time, thanks to the use of new DNA chip technologies allowing 400,000 DNA mutations to be studied simultaneously. New genes conferring a predisposition to DT2 have been identified. They include the zinc transporter of pancreatic insulin-secreting cells (ZnT8), which is a potential target for treatment. This study of the French population was carried out as a French-British-Canadian collaboration between the teams directed by Philippe Froguel (CNRS, University of Lille 2, Pasteur Institute, Imperial College London) and Rob Sladek (McGill University, Montreal, Canada). About 70% of the genetic risk of DT2 is accounted for by these new discoveries, published online in Nature. A new study from Joslin Diabetes Center may shed light on why some people can eat excessive amounts of food and not gain weight or develop type 2 diabetes, while others are more likely to develop obesity and this most common form of diabetes on any diet. The study, which used two strains of mice with differing tendencies to gain weight and develop diabetes on a high-fat diet, identified genetic and cellular mechanisms that may prevent certain mice on a calorie-dense diet from gaining weight and developing metabolic syndrome. Although this study was done with mice, it points out new mechanisms that may underlie the ability of genetically different mice -- and perhaps genetically different people -- to not gain much weight on high caloric diets, said lead investigator C. Ronald Kahn, M.D., an internationally recognized researcher who is Head of Joslins Section on Obesity and Hormone Action and the Mary K. Iacocca Professor of Medicine at Harvard Medical School. It has long been known that people significantly differ in their tendency to gain weight and develop metabolic syndrome, a group of conditions including hypertension, abdominal obesity, high triglycerides and glucose intolerance that can lead to type 2 diabetes. More than 60 million Americans either are obese or have metabolic syndrome, putting them at risk for type 2 diabetes and its frequent complications, including cardiovascular disease and other serious conditions. Currently 21 million Americans have diabetes and approximately one-third of them do not even know they have the disease. Formerly known as adult-onset diabetes, type 2 diabetes is occurring more frequently in young adults and even children. A new Joslin Diabetes Center-led study shows conclusively that a neuropeptide, melanin concentrating hormone (MCH), found in the brain and known for its role in increasing appetite in people, plays a role in the growth of insulin-producing beta cells and the secretion of insulin. This finding has the potential to spur the development of new treatments for diabetes that stimulate the production of insulin-producing beta cells in the pancreas. This latest research, conducted with researchers at Beth Israel Deaconess Medical Center in Boston and other institutions, will appear in the February 2007 issue of Diabetes. An earlier Joslin-led study examined the connection between obesity and MCH, which plays a critical role in energy balance and appetite, observing an increase in the number of beta cells when MCH levels are high. This was a new finding that had not been observed before. Although MCHs role in appetite control is well known, its effects on the secretion of endocrine hormones has not been fully understood. Yet even today, many physicians ignore the need for normal blood sugars and focus on dietary fat. The 2006 Clinical Practice Recommendations (1) of the ADA advocate large amounts of dietary carbohydrate (45 - 65% of total calories) and small amounts of protein and fat. This recommendation is preceded by the statement that "dietary carbohydrate is the major contributor to postprandial (after meal) glucose concentration." Nerve damage, kidney failure, vision loss and amputations. These are a few of the many complications people with diabetes face. Kelly Pearce was diagnosed with type 1 diabetes 14 years ago. "At the time, I knew absolutely nothing about diabetes," he says. But he quickly learned about the devastating complications that can come with the disease if his blood sugars don't remain in control. "The complications sort of drove me to find different things that would help me control it and control the diabetes better." Six months ago, Pearce became one of the first people in the country to have the new Medtronic Guardian RT Continuous Glucose Monitoring System. "It monitors the blood sugar continuously so that one knows at any point in time during the day or night what your blood sugar is," John Daniels, M.D., an endocrinologist at Washington University School of Medicine in St. Louis, tells Ivanhoe. It is well known that people with type 2 diabetes are at increased risk of pancreatic cancer, and now it seems that the risk extends to those with type 1 diabetes, researchers report. However, they point out that the risk is still very small. Millions of people suffer from the chronic pain and complications of autonomic neuropathy, a degenerative nerve disease. A new book suggests that this suffering can be effectively treated by raising blood sugar levels at key points. In doing so, Type 4 Diabetes raises the prospect that neuropathy, fibromyalgia and Alzheimer's may be all linked to diabetes as symptoms of the same problem with glucose metabolism. Insulin -- in need of some restraint? Knocking out the gene for a peptide associated with insulin secretion protects mice against the harmful effects of a high-fat diet, report researchers at the Salk Institute for Biological Studies. Their findings, detailed in the Proceedings of the National Academy of Sciences, suggest that urocortin 3, a new peptide recently discovered in the insulin secreting cells of the pancreas, plays a role in the increased production of insulin in response to high caloric intake in animals. Research at the Washington University School of Medicine in St. Louis has found that interrupting nerve signals to the liver can prevent diabetes and hypertension in mice. Removing the vagus nerve in mice resulted in preventing or reversing the development of insulin resistance and high blood pressure. Among girls at increased risk of type1 diabetes, those whose mothers had colds or certain other infections during pregnancy might be less likely to develop diabetes, new study findings suggest. Pregnant women who suffer from diabetes are more likely to have a child with memory problems, according to a new study. The researchers believe the childrens poor memories are the result of inadequate levels of iron and oxygen reaching the brains memory centre during its crucial developmental phase. A new study sheds additional light on how erectile dysfunction (ED) interacts with diabetes. The study is another step in uncovering the link between the two disorders, and may lead to improved efficacy in treatments. The study, "Lack of Central Nitric Oxide Triggers Erectile Dysfunction in Diabetes," was conducted by Hong Zheng, William G. Mayhan, and Kaushik P. Patel, Departments of Cellular and Integrative Physiology; and Keshore R. Bidasee, Department of Pharmacology, University of Nebraska Medical Center, Omaha, NE. The results appear in the March 2007 edition of the American Journal of Physiology  Regulatory, Integrative and Comparative Physiology, one of 11 peer-reviewed scientific publications issued monthly by The American Physiological Society (APS) (www.The-APS.org). Periodontal diseases may contribute to the progression to pre-diabetes, according to a new study that appears in the March issue of the Journal of Periodontology. Pre-diabetes is a condition in which blood glucose levels are higher than normal, but not high enough to be diagnosed as diabetes. The American Diabetes Association estimates 54 million people in the United States have pre-diabetes, and a significant portion of those people will develop Type 2 diabetes within 10 years. Researchers from Denmark investigated if having periodontal diseases can influence pre-diabetes and contribute to the progression of diabetes. They found that having periodontal disease can cause someone to develop pre-diabetic characteristics, and probably disturb the glucose regulation of a non-diabetic who has pre-diabetic characteristics, contributing to the progression of Type 2 diabetes. The study, conducted with rat models known to exhibit pre-diabetes characteristics, is believed to be the first to evaluate the relationship between periodontitis and pre-diabetes. "This study found that having periodontal diseases can alter the metabolic conditions which would probably lead to the progression to pre-diabetic characteristics and Type 2 diabetes," said Dr. Carla Pontes Andersen, Department of Periodontology at the University of Copenhagen. "We have known that people with diabetes are more susceptible to periodontal diseases and have more severe disease," said Dr. Preston D. Miller, Jr., President of the American Academy of Periodontology. "This breakthrough research shows having periodontal disease may aggravate pre-diabetes which is a precursor for diabetes. These findings underscore the importance of taking good care of your teeth and gums: it may be a simple way to prevent diabetes, or to prevent the progression of diabetes." New study discovers how Pycnogenol lowers blood glucose levels in type 2 diabetes. A new study to be published in an upcoming edition of the journal of Diabetes Research and Clinical Practice reveals that French maritime pine tree extract known as Pycnogenol (pic-noj-en-all) delays the uptake of glucose from a meal 190 times more than prescription medications, preventing the typical high-glucose peak in the blood stream after a meal. The study revealed the pine bark is more potent for suppressing carbohydrate absorption in diabetes than synthetic prescription alpha-glucosidase inhibitors such as Precose. The number of young children with early-onset diabetes has soared dramatically in the past 20 years, according to figures released by researchers today. A study found that cases of type 1 diabetes among under-fives increased fivefold between 1985 and 2004, with one in 1,000 now affected by the disease. Babies whose mothers had diabetes during pregnancy may be less able to form early memories than children whose mothers had normal pregnancies, a US researcher said on Friday. Scientists have discovered that having both depression and type 2 diabetes can increase the risk of death for heart patients. Although the mechanism by which the disease combinations act together has not been identified, the sinister relationship was clear as the risk of dying was increased by 20 to 30 percent. Diabetes affects millions of Americans each year. If you have been diagnosed with diabetes, you may know that the disease can cause problems with your eyes, nerves, kidneys and heart, as well as other parts of your body. Diabetes can lower your resistance to infection and can slow the healing process. A man whose grandfather died at age 30 came into our study at 31 when he was diagnosed with diabetes. We didn't tell him to count calories; we didn't tell him to say no to extra portions. He just did vegan, low fat, low sugar. He lost 60 pounds in a year, and in the course of the study his blood sugar values returned absolutely to normal. His doctors stopped all of his diabetes medications. His erectile dysfunction went away. He said, "Why didn't I do this diet 20 years ago?" He never would have had diabetes in all likelihood, had he been on this diet as a child. Patients with type 2 diabetes may soon be able to control their glucose and their cholesterol levels with a single drug, according to a study led by Vivian A. Fonseca, professor of medicine and pharmacology at Tulane University School of Medicine and chief of the Tulane University Health Sciences Center Diabetes Program. Better hygiene and clean environmental living conditions lead to a greater risk of diabetes in children, according to a new study. Researchers at Bristol University blame better hygiene conditions for the soaring rates of type 1 diabetes in children. Researchers are calling for more work in to the reasons behind a big increase of young children with Type 1 diabetes. A new study, led by Bristol University, has discovered that the number of children under five-years-old with Type 1 diabetes has increased five-fold over 20 years. Whilst the largest rise of the condition was seen in children under five, Type 1 diabetes in under 15s almost doubled during the study. There was a 2.3 per cent increase in the number of children diagnosed with Type 1 diabetes each year. People with diabetes are risking their health by not discussing their use of complementary and alternative therapies with the health professionals managing their conventional treatment. A blood component called cystatin C, used to test for early-stage kidney impairment, also may be a very early marker for those at risk of developing a condition known as pre-diabetes, a study conducted by researchers at the University at Buffalo has shown. Black soy beans, attributed to being a possible way to fight obesity and lowering cholesterol, also reduces the risk of diabetes, a new South Korean study says. The study, conducted by researchers at Hanyang University of Seoul, had groups of rats on a high-fat diet -- using both a control group and a group with black soy beans added to their diet. Over 28 days, the rats that had soy in their diets gained less weight and were healthier overall. U.S. medical scientists have found a blood marker used to predict early kidney impairment might also mark a condition known as pre-diabetes. Preliminary research suggests that use of the anti-malarial drug hydroxychloroquine may help reduce the risk of the development of diabetes in patients with rheumatoid arthritis, according to a study in the July 11 issue of JAMA. Dr. Neal Barnard, president of the Physicians Committee for Responsible Medicine, has shown that switching to a vegan diet can significantly control type 2 diabetes, and, as an added bonus, people lose weight while eating as much fruits, vegetables, beans and whole grains as they want. Pumpkin - A fairytale end to insulin injections? Compounds found in pumpkin could potentially replace or at least drastically reduce the daily insulin injections that so many diabetics currently have to endure. Recent research reveals that pumpkin extract promotes regeneration of damaged pancreatic cells in diabetic rats, boosting levels of insulin-producing beta cells and insulin in the blood. Chinese scientists found that diabetic rats fed the extract had only 5 percent less plasma insulin and 8 percent fewer insulin-positive cells compared to normal healthy rats. Avoiding meats and fatty foods and eating lots of salads and cooked vegetables appears to reduce the risk of developing type 2 diabetes, according to study findings published in the American Journal of Epidemiology. Pumpkin extract has insulin-like effects that could help people with diabetes keep their blood sugar under control, results of an animal study hint. Under controlled feeding conditions, long-term TFA consumption was an independent factor in weight gain. TFAs enhanced intra-abdominal deposition of fat, even in the absence of caloric excess, and were associated with insulin resistance, with evidence that there is impaired post-insulin receptor binding signal transduction. Chronic conditions such as diabetes mellitus (DM), coronary artery disease (CAD), and cerebrovascular disease (CVD) have been associated with periodontal disease. The association between periodontal infection and systemic health has important implications for the treatment and management of patients. Systemic health is often association with the condition of the oral cavity, in that many systemic diseases manifest in the mouth; however, less is known about the connection between a diseased periodontium and the impact it may have on systemic health. Today, a diagnosis of type I diabetes means a life sentence of medical follow-up. The latest study published in the journal Nature by Dr. Constantin Polychronakos, director of the Pediatric Endocrinology Department at the McGill University Health Center, in collaboration with Dr. Hakon Hakonarson, director of the Center for Applied Genomics of the Children's Hospital of Philadelphia, provides hope that this situation will evolve in the long term toward a cure for this disease. These findings, coupled with those concerning diabetes prevalence, suggest that OC pesticides and nondioxin-like PCBs may be associated with type 2 diabetes risk by increasing insulin resistance, and POPs may interact with obesity to increase the risk of type 2 diabetes. A class of drugs commonly used to treat type 2 diabetes may double the risk of heart failure, according to a new analysis by researchers at Wake Forest University School of Medicine and colleagues. Not Sweet - Couch Potatoes Spike Glucose? It has long been known that type 1 diabetes is an autoimmune disease. The body attacks the islet cells in the pancreas that produce insulin. In recent years, the immune system has also been implicated in type 2 diabetes  in particular imbalances in cytokines, an immune system component that causes inflammation. Metformin, a glucose-lowering drug, is one of the most widely prescribed drugs for type-2 (adult-onset) diabetes. But the longer a person takes the drug, especially at high dosages, the more likely he will develop a deficiency of vitamin B12. Researchers have known since the early 1970s that almost one-third of patients taking metformin have problems absorbing vitamin B12. Studies have found that metformin reduces blood levels of the vitamin by 14 to 30 percent. People who have type 2 diabetes are more likely to develop Parkinson's disease as they age, though researchers are uncertain what accounts for the link between the two diseases, according to a new study being published in the April issue of Diabetes Care. Cells from a pig transplanted into a diabetic man from New Zealand are still producing insulin nearly 10 years later, prompting a biotechnology company to plan research to see if others could benefit. The case, profiled in a scientific journal issued on Friday, may pave the way for a cure for diabetes, said Bob Elliot, medical director of Australia's Living Cell Technologies (LCT). In the most comprehensive look at genetic risk factors for type 2 diabetes to date, a U.S.-Finnish team, working in close collaboration with two other groups, has identified at least four new genetic variants associated with increased risk of diabetes and confirmed existence of another six. The findings of the three groups, published simultaneously today in the online edition of the journal Science, boost to at least 10 the number of genetic variants confidently associated with increased susceptibility to type 2 diabetes - a disease that affects more than 200 million people worldwide. "This achievement represents a major milestone in our battle against diabetes. It will accelerate efforts to understand the genetic risk factors for this disease, as well as explore how these genetic factors interact with each other and with lifestyle factors," said National Institutes of Health (NIH) Director Elias A. Zerhouni, M.D. "Such research is opening the door to the era of personalized medicine. Our current one-size-fits-all approach will soon give way to more individualized strategies based on each persons unique genetic make-up." The sore on Catrina Hurlburt's leg simply wouldn't heal. Complications from a 2002 car accident left Hurlburt, a borderline diabetic, with recurring cellulitis and staph infections. One of those infections developed into a troublesome open sore that, despite the use of oral antibiotics, continued to fester for nearly eight months. Nutrition 21 Inc. today announced new published results from a 447 subject, randomized, double-blind, placebo-controlled clinical study that showed Diachrome, a patented combination of chromium picolinate and biotin, significantly improved glycemic control in patients with poorly controlled blood sugar levels who were being treated with oral anti-diabetic medication (OADs). Browse and download educational materials and tools designed specifically to help patients and their families manage diabetes. Dr. Jennifer Eddy of the University of Wisconsin is currently conducting the first randomized, double-blind controlled trial of honey as a treatment for diabetic ulcers - not to eat, but as a salve. According to Dr. Eddy, honey's acidic nature, low water content, and the hydrogen peroxide secreted by its naturally-occurring enzymes make it perfect for combating organisms that have developed resistance to standard antibiotics. Allie's institution comprises a dozen clinics that treat 200,000 patients every year, many of them with diabetic ulcers. To avert amputations stemming from those ulcers, he has become an early adopter of a new technology that he considers "as important as anything that's come along." Called Microcyn, it consists of a souped-up water molecule with special properties that knock out single-cell organisms, including the antibiotic-resistant bacteria now proving lethal to many hospital patients. It also flattens viruses, spores and fungi. Causing no harm to multi-cellular organisms - all critters large and small - it is the first nontoxic anti-infective. Alzheimer's disease, Parkinson's disease, type 2 diabetes, the human version of mad cow disease and other degenerative diseases are more closely related at the molecular level than many scientists realized, an international team of chemists and molecular biologists reported April 29 in the online version of the journal Nature. Studying the mechanisms of glucose homeostasis and early diabetes, Vamsi Mootha (Massachusetts General Hospital and Broad Institute), Leif Groop (University of Malmo) and colleagues have identified a key regulator of glucose homeostasis in humans. You lose about eight years from your expected lifespan if you are diagnosed with diabetes after 50.